MapLight's analysis raised questions about the influence of campaign contributions connected to Puzder, highlighting significant contributions to senators from Puzder and his wife, as well as his company and a major trade association that endorsed him. Puzder is the CEO of CKE Restaurants, the parent company of the Carl’s Jr. and Hardee’s fast-food chains and an active member of the National Restaurant Association, which publicly endorsed his nomination. He and his family are prolific donors to political candidates and causes. Their combined contributions totaled more than $1.2 million to 79 senators who were set to vote on Puzder’s nomination. The Puzders donated more than $1.2 million to the senators who would be voting on his nomination. During the 2016 election cycle, the Puzders significantly escalated their political giving. They contributed almost $700,000 to candidates and outside groups, more than twice the amounts they contributed in 2012 or 2014 according to data from the Center for Responsive Politics. While in previous election cycles a small portion of the Puzders’ political contributions went to Democrats, they contributed exclusively to Republicans in 2016. 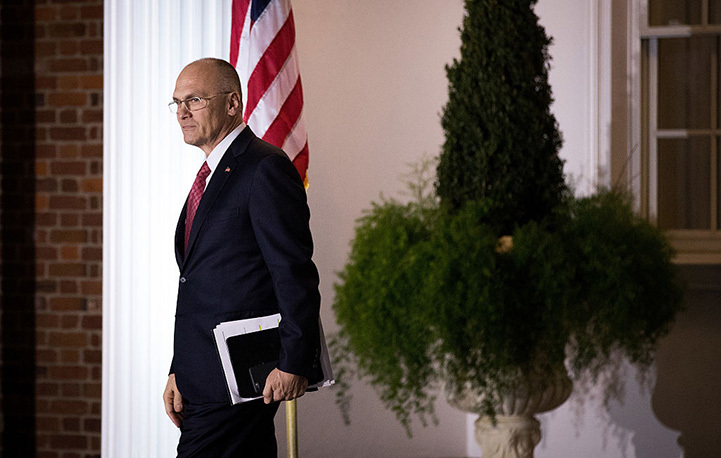 Organizations associated with Puzder have also lobbied the federal government heavily, often pertaining to issues that fall within the purview of the Secretary of Labor. CKE Restaurant franchises have been repeatedly accused of violating wage and labor laws, with several of Puzder’s restaurant employees describing poor working conditions at a recent panel convened by Democratic senators. MapLight’s analysis was also cited by activists opposing Puzder’s nomination, with the Center for Responsive Politics and the National Institute for Money in State Politics sharing our findings on Twitter. ReThink Media and Every Voice also shared our data with their followers in their daily news clips and in a press release. With fears brewing that he could not rally enough votes for confirmation, Puzder withdrew his candidacy. Shortly thereafter, former federal prosecutor Alex Acosta was appointed and confirmed as Secretary of Labor. Despite the failure of Puzder’s candidacy, Trump’s consistent nomination of prominent Republican donors including Betsy DeVos, Linda McMahon, Rex Tillerson, and Wilbur Ross has done little to reassure the public that his administration will remain faithful to his campaign promise to “drain the swamp” in Washington. MapLight analyzed campaign contributions from PACs and employees to the principal campaign committees of senators in the 115th Congress through June 30, 2016. Our contributions data comes from OpenSecrets.org and the Federal Election Commission. Lobbying data analysis consists of federal lobbying disclosure filings since 2008 available from the Clerk of the U.S. House of Representatives as of February 6, 2017.